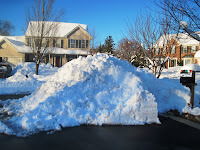 The Washington DC Metro area has been hit with what many are calling "Snowmagedon"... our second blizzard this year. Friends from upstate New York are wondering aloud 'When did I move back to Buffalo?' I want to assure you that we DO have winters like this, but not often. And, we do have winters where it is ice storm after ice storm, but that's not common either. Or, we can have winters where we are lucky to geta few inches of snow enough to take a nice photo. To be honest, the beauty of living here is that you never really know kind of winter you're going to have. This storm, I believe, hits the #1 spot for most snowfall in just about all areas in our region. Here in Loudoun, the 'official' snowfall count is 34.5 inches. That seems about right for what I found at my home in Leesburg, the county seat. We had mounds yesterday shoulder height from drifting and snow blowing. Except for the fact that my husband is working when we get snow like this, I actually didn't mind (after my dad fixed my snowblower - thanks, Dad!!). It's rather fun. Follow this link and enjoy the pics (CLICK HERE) - I love the one with the white dog jumping, and the one with the snowplow/sand truck on it's side in a ditch. There are photos of the organized snowball fight in DuPont Circle (DC), of the historic church collapse, and the downed power lines; grown ups working trying to clear a path to.. well, nowhere in many cases.....and kids, dogs and grown ups playing everywhere. The Mighty Midget - that's here in Leesburg. Enjoy. I will post again later with my own pics and some from friends. The moral of this story, my friends, is that you should NOT be like my son and get rid of your winter coat - even if you think you won't need it any time soon. Here in Northern Virginia, you need all kinds of clothes. You'd think my son would have known that.